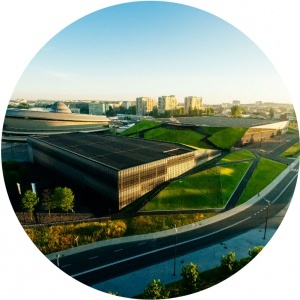 The International Congress Centre (ICC) in Katowice is among the best facilities in Poland for business events. Finished in 2015, the building is characterized by its post-industrial aesthetic and functional design. It is ideal for congresses, conferences, exhibitions, fairs, and other spectacles. The facility can accommodate up to 15,000 people and, together with Spodek next door, is one of the largest business/entertainment arenas in Poland. 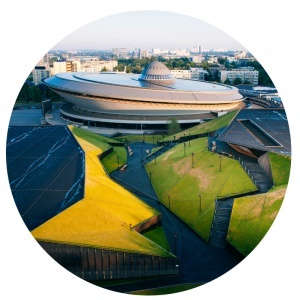 The International Congress Centre in Katowice was named the best congress facility in Poland at the 2015 Meeting Planner Power Awards. The ICC was ahead of other prestigious buildings in the contest final. The jury distinguished the ICC for its ability to host business and entertainment events, its attractive aesthetic, and innovative solutions for industry events. 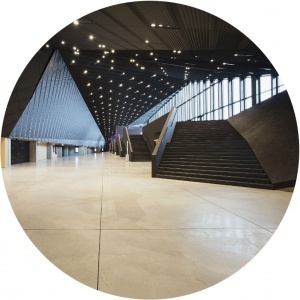 The International Congress Centre (ICC) was number one in the Bryła Roku 2015 competition (Building of the Year). In the competition, organised by architectural service bryla.pl, the ICC won the most votes from internet users, 3rd place from the jury, as well as honourable mention from the competition sponsor. The ICC, whose construction is influenced by the newest architectural trends, is brand new and still undiscovered. The remarkable construction of the ICC building in combination with the green valley leading towards Spodek creates a unique atmosphere and energy. The exquisite wood, glass and steel of the ICC ensure adequate surroundings for a demanding business environment. The area and capacity of the facility is conducive to both large business events and intimate business meetings.